O Canadas and High Fives, originally uploaded by Mister Wind-Up Bird. 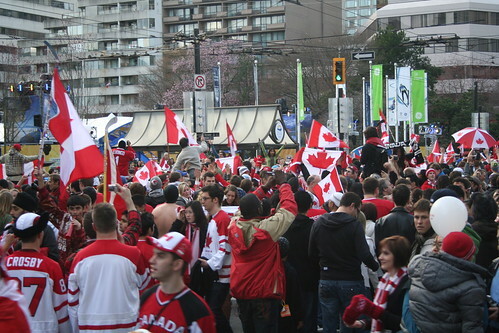 Robson & Howe about 20 minutes after Canada won the gold in men’s hockey. I’ve never seen such an outpouring of joyous patriotic fervor — you can’t hear it, but the crowd was singing O Canada. I’ll admit it, I was a little choked up and yes, I’ll say it, proud to be a part of it all and proud to be Canadian. Despite going out of my way to really not have much to do with the whole thing at all. And on that highest of high notes, the olympics left Vancouver, like an annoying house guest that always wants to be doing something when you’re working, but then they leave and you sit alone in your apartment and you’re all “well… now what do I do?” The streets and skytrain were unnaturally quiet, the red and black Canada hoodies were gone, and nobody asked me directions or randomly high-fived me. The olympics came and went, and all I got was two sweet, sweet weeks of uninterrupted thesis work.